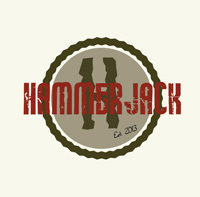 England's Hammerjack hit the ground running in 2013, with friends intent on playing old school hard and heavy rock. 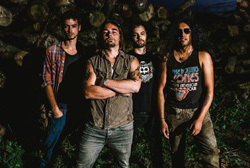 They cut their first EP in 2014 and played gigs throughout their native UK and Europe, hooking up with some heavyweights like Status Quo and Lord Volture. Now they return with a second EP, self-titled, with four new songs. I pretty much gave away Hammerjack's sound in that very first sentence. There's is classic hard rock with lots of groove, even some AC/DC like boogie, good melody and harmony in the guitar lines and vocal arrangements. Although vocalist Sharpy is rather raw and unrefined, sounding either screamo or that he can't sing at all. He sounds like a mash up of Bon Scott and Axl Rose. The songs are peppered with rowdy and ripping guitar solos. There's some nice variation to the guitar lines, including something that sounds like bottleneck or Southern slide guitar in More Than Nothing. It's also a groove monster and a headbanger, definitely keeping your interest. Bottom line, all four songs are solid, uncompromising, hard and heavy rock. Exactly what Hammerjack was aiming for. But I wonder, after three years at their craft, isn't it time for a long player? Within their second EP, all four songs are solid, uncompromising, hard and heavy rock. Exactly what Hammerjack was aiming for.